According to Statistics Finland, the housing costs of owner-occupied dwellings increased by 0.8 per cent in the fourth quarter of 2015 from the respective quarter of the year before. According to preliminary data, the price for purchasing dwellings increased by 0.7 per cent over the same period. 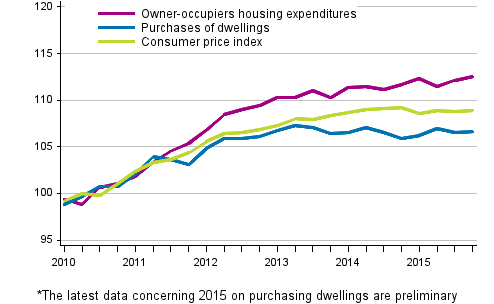 Compared with the previous quarter, the housing costs of owner-occupied dwellings rose by 0.3 per cent and purchasing of dwellings became 0.1 per cent more expensive. ISSN=2341-6971. 4th quarter 2015. Helsinki: Statistics Finland [referred: 24.4.2019].